Select an option... 1.25 in. 2.25 in. 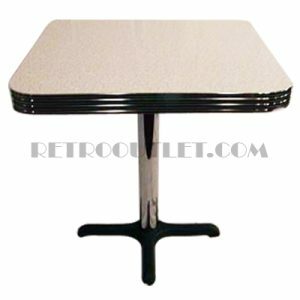 Perfect cafe seating with this Round Retro Table 30 inch with Base shown with 2.25″ real metal banding and a classic chrome column base. If purchased in a 42″ bar height table, you have the option of adding a foot ring for additional seating comfort. Available in your choice of standard, premium boomerang or cracked ice laminates. This is your opportunity to build your table to your specifications. Two Year Structural Warranty Against Manufacturer Defects on Bases and Tables.